Your days: powered by a potent mix of spit, elbow-grease, gumption and the occasional well-timed espresso. Your nights: pizza and beer should do it. 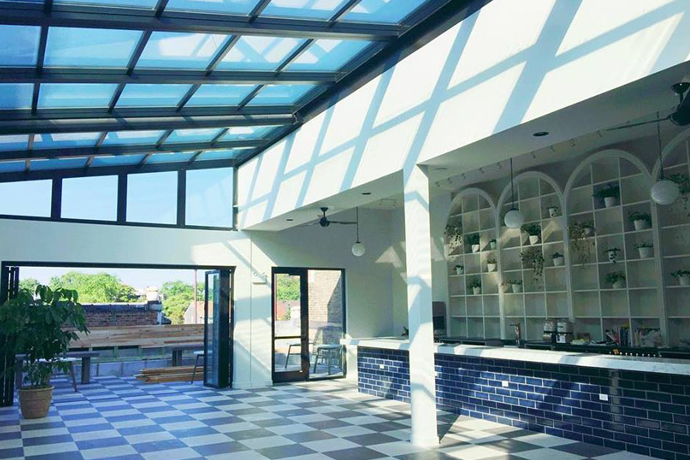 Welcome to The Boiler Room, a gritty spectacle of a Chicago beer-and-pizza joint, opening tonight in Logan Square. During the day, 18 roof solar panels soak up rays, ensuring that by the time you crawl in (say, around 2am Saturday), crazy pizzas like the Logan (mole and pulled pork) and the Fu Manchu (Thai barbecue) are piping hot. The bar’s turn-of-the-century boiler backdrop sets the stage for a sophisticated beer lineup, plus cocktails like the 1988, mixing horchata-flavored rum with espresso and vanilla vodkas. It’s served with a side of Cinnamon Toast Crunch, in case you need a complete breakfast. If all this visual and culinary stimulus isn’t enough, you can always jump in on a bingo game (really) or the occasional bags tourney on the huge back patio. There’s also a rumor of a lady arm-wrestling night. So bring your big guns.